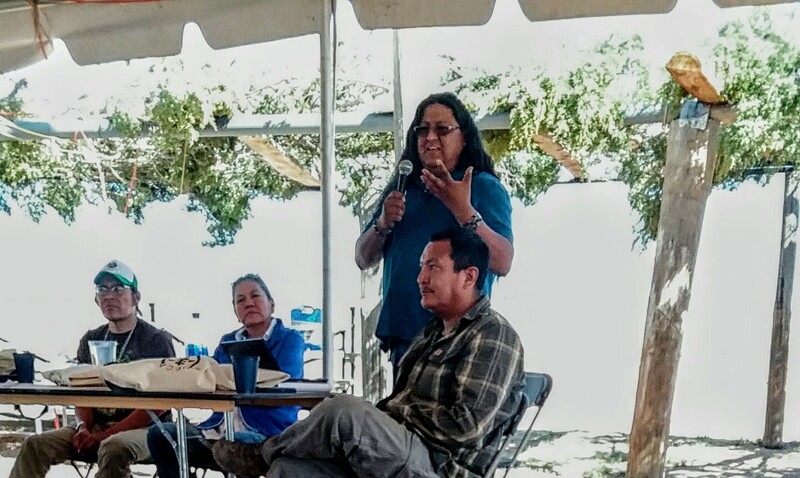 DILKON, Navajo Nation -- Nate Etsitty, Dine', shared his love of permaculture and food sovereignty, during Dine' CARE's Western Peoples Convention on Sunday. As an idea maker who studies natural designs in nature, Nate shared his discoveries in permaculture, gardening and natural patterns, including natural sediment and dryland farming techniques. Speaking during the three day convention, June 1 --3, Nate said his interest in college was in packaging and anthropology, but this changed when he moved back home to Navajoland. "I moved home and rediscovered who I am." Since childhood, he has spent his time talking with the trees. While observing the world around him, he watched the systems and thought there must be better ways to do things. This is when he discovered permaculture on his little 'rez' phone, read all he could and downloaded what he could. "We see these patterns naturally." Nate discovered he did not have to create his own system. While studying permaculture, he read books, and searched for books on traditional Dine' farming in the local libraries and colleges. But he found little available. Then a presentation by Roberto Nutlouis sparked his attention, and he read all he could. This led him to attend classes and study organic agriculture. Among the principles he learned was this -- 'Earth care: We take care of our Mother, and she takes care of us.' One principle of Earth Care is putting organic matter back into soil. When people ask why Dine' are no longer farmers, he says, "Do you know your neighbors?" To help inspire farming, he said we need to involve children when they are young. The permaculture principle is to share, and never horde when there is abundance. "If we have surplus, we share." Permaculture is a way of seeing the world through nature's lens. "Observe and interact," is the first principle, he said, encouraging others to observe the sun, water flow, and all the natural patterns. "Capture and store energy," is another principle, including using solar power. Along with this, creating energy sources and creating healthy soil are guiding principles. Nate said on Navajoland, there are now "lasagne beds," which means applying organic soil in layers. The work of recharging aquifers is also underway. Nate said when you find systems that work, you repeat those systems. There is no need to try things over and over that fail, he said. Along with this comes accepting feedback. 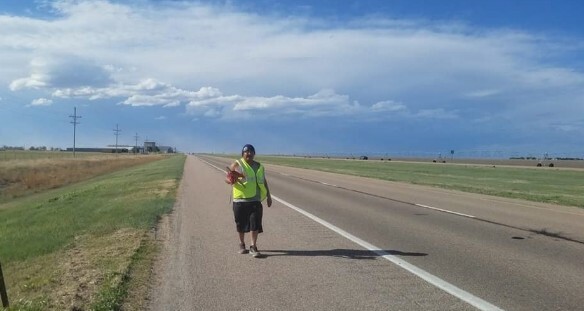 Nate said hemp is an awesome plant, that heals the land, and can heal the body as well, including the body from the poisons and diseases from the fossil fuel extraction that surrounds Navajos. Nate pointed out that horses are no longer used as working animals in agriculture, and animals can be used to regenerate the soil. The permaculture principle is to start small and slow. And all of this needs community. Nate shared how he created raised garden beds around his hogan, and then a monsoon rain came. "We went through the winter without having to buy food, we had so much corn." When looking at trees, he said, stand back and look at the full design of the trees. Nate is also working with community gardens. "I love to teach people how to recycle." He said everything should have three uses before you toss it, including items like newspapers and water bottles. "I work mainly with youths, here in Dilkon." Nate also wants to bring back orchards locally. One tool that is useful working with the land is a wood chipper, which can be used to create mulch. Recently, they chopped down the troublesome tamarisk trees and used these in arroyas, which keeps sediments back and builds the washes back up. "Kids are really hungry for this kind of knowledge," he said. Nate has worked in Ganado, Greasewood and Teesto with children and young people wanting to plant, and create gardens. "I am an idea maker, I like to create concepts." Permaculture is a system of agricultural social design principles centered caround simulating or directly utilizing the patterns and features observed in natural ecosystems. The term permaculture was developed and coined by David Holmgren, then a graduate student, and his professor, Bill Mollison, in 1978. The word permaculture originally referred to "permanent agriculture", but was expanded to stand also for "permanent culture", as it was understood that social aspects were integral to a truly sustainable system as inspired by Masanobu Fukuoka’s natural farming philosophy. Copyright Brenda Norrell. No portion may be used without permission or for revenue producing projects.